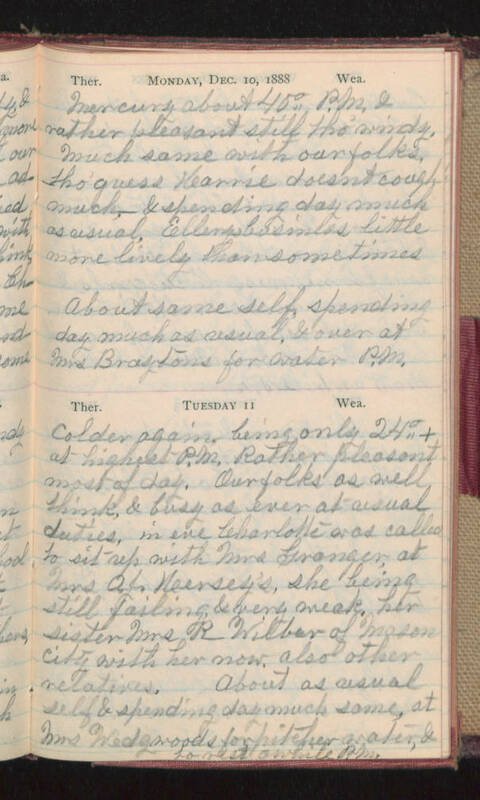 Monday, Dec. 10, 1888 Mercury about 40° P.M. & rather pleasant still tho' windy. Much same with our folks, tho' guess Karrie doesn't cough much, & spending day much as usual. Ellerys business little more lively than sometimes. About same self, spending day much as usual, & over at Mrs Braytons for water P.M. Tuesday 11 Colder again, being only 24°+ at highest P.M. Rather pleasant most of day. Our folks as well think, & busy as ever at usual duties, in eve Charlotte was called to sit up with Mrs Granger, at Mrs A. J. Hersey's, she being still failing, & very weak, her sister Mrs R- Wilber of Mason City with her now, also other relatives. About as usual self & spending day much same, at Mrs Wedgwoods for pitcher water & to rest awhile P.M.